This isn’t a choice: it’s a tragedy. But it’s also a brutal reality for families in Yemen right now. Millions of people are going hungry and thirsty every day as war destroys their ability to survive. The scale of the need is staggering: over 80% of the population – that’s more than 20 million people – are struggling to find enough food and water to survive each day. This includes 10 million people in acute need of immediate assistance to save or sustain life, and 10 million people who require assistance to avoid slipping into acute need. So far we have helped more than 2 million people including distributing food to families in need; providing cash to families so they can purchase for themselves the food and other supplies they need; rehabilitating water sources and providing access to safe water; providing hygiene kits for women; and providing livelihoods training and support to women. 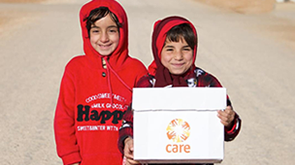 CARE is reaching around one million people a month and is willing and able to reach many more. More funding is needed to enable CARE and other humanitarian organisations to scale up and provide life-saving supplies to as many people as possible. Women and children are already dying from malnutrition in Yemen and the situation could grow far worse. 1.8 million children are suffering from acute malnutrition, of whom 400,000 children under five are suffering from severe acute malnutrition. Children suffering from severe acute malnutrition are 10 times more at risk of dying compared to other children, due to a weakening of the immune system. There are around 1.1 million malnourished pregnant and breast-feeding women. Water shortages combined with the destruction of infrastructure and the lack of a functioning health service has led to a serious cholera outbreak, described by Wael Ibrahim, CARE’s Country Director in Yemen, as the world's worst cholera outbreak. Malnourished children, pregnant women and people living with other chronic health conditions are now at greater risk of death as they face the triple threat of conflict, hunger and cholera. The ongoing conflict also means that people who are struggling to survive in the face of airstrikes, violence and economic collapse, are also desperately short of supplies and the urgent humanitarian assistance that they need. Hunger is a direct result of war. The highest levels of food insecurity are in areas experiencing the heaviest fighting – the northern governorates of Hodeidah, Sa’ada, Hajjah, Amran and Taiz. 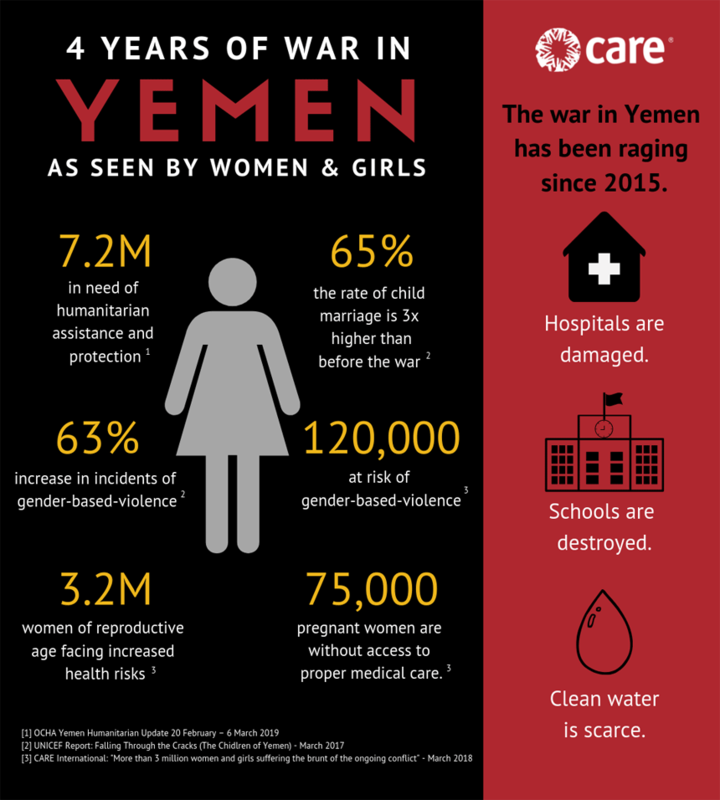 The number of people affected and the level of need mean Yemen’s people are suffering the world’s worst humanitarian crisis (figures below from 2017, since when the severity of the crisis for affected people has only got worse). The vast majority of humanitarian workers are Yemeni, and over the past four years they have been watching their own people starve to death in front of them. Not to mention experiencing increasing hardship themselves. There is no question that people would be dying faster and in much greater numbers without humanitarian aid. This conflict has brought death to every single house in Yemen, families are losing their beloved either by ground shelling, airstrike, hunger, epidemic disease, natural disasters… Death has become the daily news in Yemen. We are focusing on making sure that people in the hardest-hit and most hard-to-reach areas have access to emergency supplies and assistance with meeting their basic needs, including food and water. The near-collapse of public services – only 45% of health facilities in Yemen remain, with limited functionality – means that we are also providing sanitation, hygiene, and livelihoods support. Yemen now has the highest level of humanitarian needs in the world. 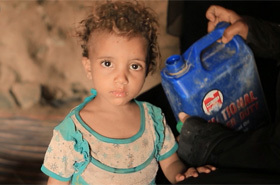 Even before the conflict, Yemen was one of the poorest countries in the world, with access to adequate food and safe water a problem for more than half the population. Since 2006, Yemen has also ranked as the lowest country in the world for gender equality. Since the violence erupted in March 2015, the humanitarian needs have escalated at an alarming rate. As the conflict continues, the enduring lack of fuel, food and medical supplies is deeply affecting the majority of the country's people. It is estimated that more than 20 million people – 80% of the population – are in need of humanitarian assistance, particularly food, clean water and healthcare. People are going hungry and malnutrition, particularly among children, is growing. 10 million are classed as severely food insecure – that means they don't have enough food to eat, and don't know where the next meal is coming from. 19 million people lack clean water and sanitation, of whom 10 million lost access to water due to the conflict. The health sector is collapsing: 14 million are without adequate healthcare. Unemployment has skyrocketed and many families have depleted their savings in the face of soaring food prices. Nearly 3 million people have fled their homes, seeking safety elsewhere in Yemen or in neighbouring countries. Many have used all of their life savings to travel to safer areas. Some have found shelter with host communities, but half of the displaced people are staying in public and abandoned buildings or temporary shelters. CARE’s emergency response has so far (September 2018) assisted more than 2 million people (9% of the total affected population) mainly through water, sanitation and hygiene, and food security support. CARE is focused on helping the most vulnerable people, especially women and girls. We are distributing food to families in need. We also distribute cash vouchers so that families can purchase for themselves the food they need. Over a year of fighting and fuel shortages has destroyed water pipes and water pumping facilities, so CARE is rehabilitating water sources and providing water tanks so women and children can get safe drinking water without having to travel long distances. CARE is also providing hygiene kits, paying special attention to women’s and children’s needs. CARE is particularly concerned about the impact of the conflict on women and girls. Women have limited participation in society and are considered to have a lower status than men. The breakdown of safe water supplies, which means women and girls have to travel long distances to collect water, is also a cause for concern as it makes women and girls more vulnerable to sexual violence. Overcrowding in shelters also makes women and girls more vulnerable to violence. With many damaged and destroyed healthcare facilities and lack of supplies, an estimated half a million pregnant women cannot access desperately needed medical treatment. As food becomes more scarce, a common coping mechanism for women in Yemen is to eat less while maintaining their domestic workload. Women are also facing increased responsibilities since the onset of the conflict: 30 percent of displaced women are heading their families, and the vast majority have no regular income to help meet their family's needs. What's it like for women and girls?